I've been meaning to make a tea cosy for myself for a while and since I've been spending more time in my home office I'm drinking much more tea by myself. To help prevent the too-cool-second-cup problem I thought it was a good time to find a nice pattern and get it sorted. My number one source for knitting patterns is Ravelry so I did a pattern search for an easy tea cosy and this lovely pattern called Little Cupcake Tea Cosy by Lisa Sisk caught my eye. The pattern is available for free on Ravelry or it can be purchased for 3 Euro from This Is Knit. 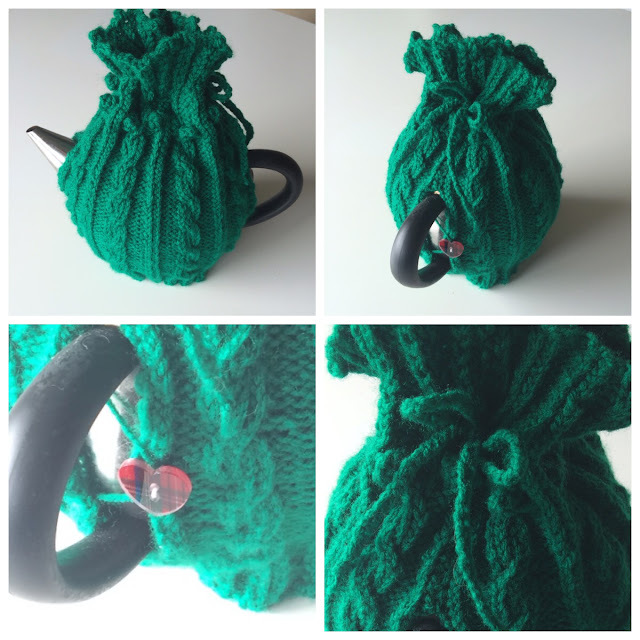 When I went over to my box of yarn to pick one out for this project, this green colour immediately jumped out at me and it's perfect for a St Patrick's day tea cosy. 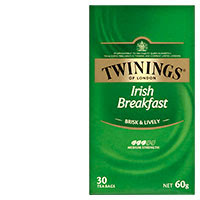 Now I just need to pick up some Irish Breakfast tea from the supermarket and I'm all set. Are you a hot drink fan? Or would you prefer a nice Guinness? I last did this race in 2012 and I did it in 1:20:58. It's a big event, very popular with individuals, groups and particularly workplaces. Lots of people were wearing t shirts with their company slogan on it and at the finish area companies hire out marquees and put on food for their participating colleagues. 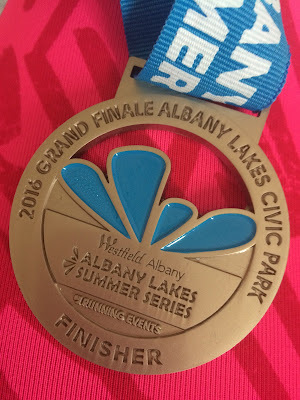 We had decided last minute to enter this event since we had done well during the Albany Lakes series and this race is all flat along the water front we thought we could do good times. We had to pick up our race packs and then we decided to grab some lunch in town. We went to the crab shack and had salads and beer and it was so nice I could have stayed there all day just drinking beer in the sun. The start area had been colour coded depending on how fast you intended to go. Kane had a blue runners bib and I had a red joggers bib so we hung out together for as long as we could and then had to split into our respective zones. The coloured zones were a great idea in theory but perhaps other people didn't understand them because they were largely ignored and there were lots of blues, reds, and purples (walkers) up in Kanes section and by the time I made it to the start line there was a large family all walking across the start line together. It took me a good 1.5km or so of dodging all the walkers and pushchairs before I finally had a little bit of space. 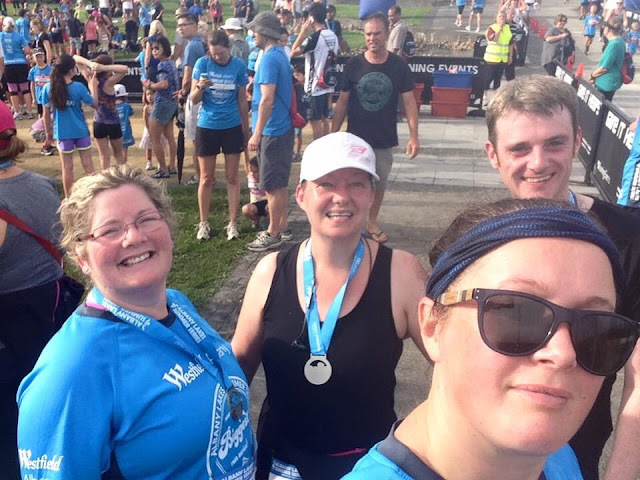 I probably ran 10km in total with all the weaving I did! There was lots of entertainment on the course, water stations were spraying water into the crowd and there was a candy bar part way along the course too. I high-fived 4 ladies on stilts. Overall though I just enjoyed listening to my own music shutting out the audible stimulation and being carried along in a wave people being both a part and apart. The finish line was upon me before I knew it. It took me by surprise, I thought it was further away and I was skipping through my playlist to find a good song to finish on. I didn't even get to the chorus! I crossed the line and trying to fire up my app to stop timing but my hands were so sweaty I couldn't get it to recognise my finger print so I had to type in my password with shaky sweaty fingers. It worked on the third attempt. I got my water, found Kane, got a beer and we swapped race stories. Our results were immediately available to us via the Round the Bays app which was pretty awesome. 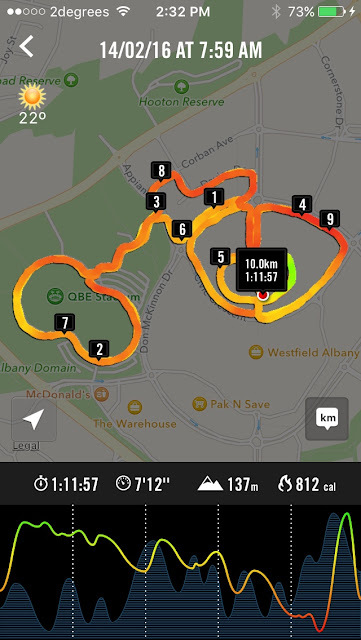 We then walked the same route back to get back to the car and then we went straight to McDonalds for one of their Create Your Taste vege burgers that's become our Sunday post run treat. I was really happy with my time and I got a new pb for the 5k as well. I feel like I'm really making progress! 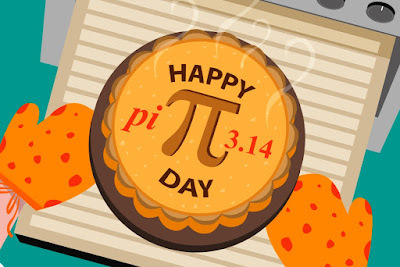 Happy Pi day math fans! Whilst I do like maths, I love pies more and I'm happy to have any excuse to make pies. I love both savoury and sweet pies. Back in Scotland they do macaroni cheese pies and rhubarb pies both are in pastry shells made of hot water pastry and they are so good. You don't get those here so if I want them I'll have to try and make my own hot water pastry and I'm just not that brave yet. Frozen pastry is what I tend to use in my pie making and I normally use puff pastry but sometimes I use short pastry. For dinner I made a simple vegetable pie. My aunt used to make vegetable hand pies that were the best and I've been trying to recreate them but I've still not got it quite right. Since I've been really in to using my pressure cooker lately, I was able to cook the pie filling quickly, actually it took longer to peel and chop than in did to cook! I diced up potatoes, onions, carrots and sautéed them in some butter then added frozen peas and corn and a chicken flavour stock cube in boiling water. I lined a pie tin with thawed puff pastry, added the filling and sealed some pastry on top. I gave it an egg wash and popped it in the oven. Next time I'll need to remember to spray or grease the pie tin though because it was a little tricky trying to get it out! For dessert I made a blueberry pie using most of a bag of frozen blueberries heated in a pot with a cup of caster sugar and then added this filling to some more of thawed pastry sheets. We served this with lemon ice cream and it was too delicious to stop and take a photo, oops! Do you have a preference of savoury or sweet pies? This was the final race in the series and my second go at the 10k. 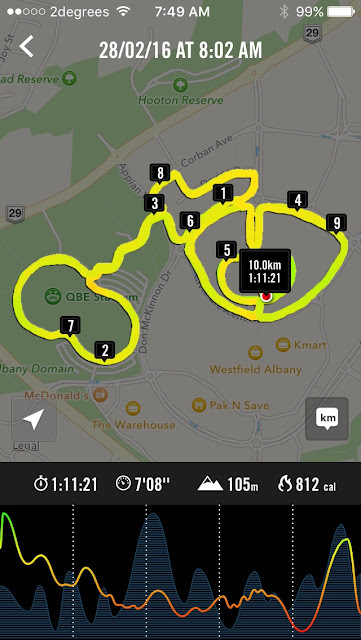 For the grand finale, the course would normally change so that we could run through the QBE stadium and the mall but due to weather forecasts predicting a storm and the heavy rain the day before, this was changed to the regular course. I'm glad that on race morning everything was nice and dry and we did not have any rain at all. The grassy areas around were still wet in patches but by the time prize giving came around at 10.30 am this had dried up too and we were able to sit and relax on the grass. I had a dinner event on the Friday and drank way waaaay too much champagne and spent most of Saturday morning and early afternoon feeling sorry for myself. Later in the afternoon I was ready to start hydrating and I also managed to eat some instant noodles and then later a rather delicious pasta bake. We were running very late in the morning so didn't have time for breakfast but I wanted to try a mix of fruit juice and water instead of plain water so see if that would help in the second part of the race. We made it to the start area as the gun went off and we hurriedly tried to pin our race numbers on ourselves and make our way past all the waiting walkers who start 3 minutes later. I was almost at the start line as the gun went off for the walkers and I gently ran through them trying to find a little space for myself. I still had a lot of adrenaline from rushing around being late and started off perhaps a little too fast but I settled into a good pace by 2.5k and maintained that pace for the rest of the race. There were far fewer people around in the second half of the race and I was trucking along at a really steady pace. I had started to struggle at this point in race 2 but I was feeling really good this time around. The last 2.5k is steadily up an incline and at no point did I feel the need the walk, in fact, I started overtaking several people who were walking. I'm not sure if it was due to my fruit juice and water mix or the week of training inbetween or even the hangover effects but I was feeling good and it was a marked difference from the race before. I'll keep training and I'll try the fruit juice and water mix again but I'm less keen to try the hangover again!! I was really proud of myself for running the whole distance and not suffering like last time and I was really happy to have shaved 39 seconds off my time. Part of me is disappointed though because I was feeling so good and ran such a steady race that maybe I should have pushed a little harder in places and I would have got an even better time. Ultimately I think it all comes down to race experience; I'm building a list of what works and what doesn't, but I'm also learning about how things feel, when to push and when to conserve. The prize giving was quite extensive with winners in all race categories receiving an award and also people who have taken part in 5 series receiving a race legend award and of course there were the spot prizes of mall vouchers, restaurant vouchers, running shoes, a BBQ and a big TV. I've really enjoyed this series and I'm hoping to do it again next year. 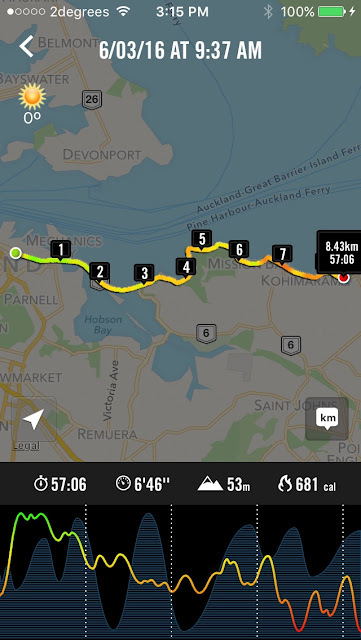 As for my next race, I think I'm going to enter the Round the Bays 8.4km this weekend. I'm becoming a race junkie!